Each meal made for the guests at the Rifflin'Hitch Lodge in Southern Labrador, Canada is prepared by a gourmet chef who starts preparing early in the morning so breakfast is ready when the guests awaken. Dinners such as this one is elegantly prepared with a mouth watering lobster tail topped with a special sauce, a thick slab of beef cooked as guests like it and a mixture of vegetables. 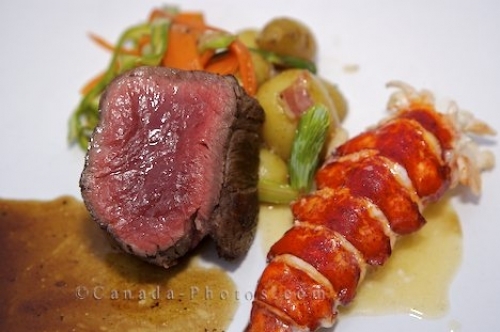 Photo of a lobster tail meal served with beef, vegetables and a special sauce at the Rifflin'Hitch Lodge in Southern Labrador.